A recent report* has highlighted the issue of pay inequality. We are writing this open letter to ask about your plans to reduce pay inequality, by committing to reduce or maintain the council’s pay multiple, making companies which are awarded council contracts accountable for pay gaps and by ensuring that all workers are paid the Living Wage. Eight out of ten of Greater Manchester councils’ highest earners are in the top 1% of British earners. The pay multiple – the difference between the pay of the highest earner and the average salary – at Tameside Council is currently 8.3, making it the third most unequal council in Greater Manchester. There is significant potential here for your council to contribute to local equality and prosperity by sharing taxpayers’ money more evenly among the council’s workforce, especially by increasing the wages of your lowest paid staff. We would be grateful to hear what plans your council has to improve pay equality. do you have any intention of setting a limit to the pay multiple between top-earners and those on average salaries and making companies which provide council services accountable for pay gaps? It is encouraging to see that Tameside Council plans to become an accredited Living Wage employer. We hope that work will now begin to secure living wages for people working on council contracts. It would be useful to know what steps you plan to take to ensure that all workers receive wages they can live on. We look forward to hearing from you. Please note that we intend to publish a summary of responses in local media. A number of Greater Manchester residents have also expressed their support. 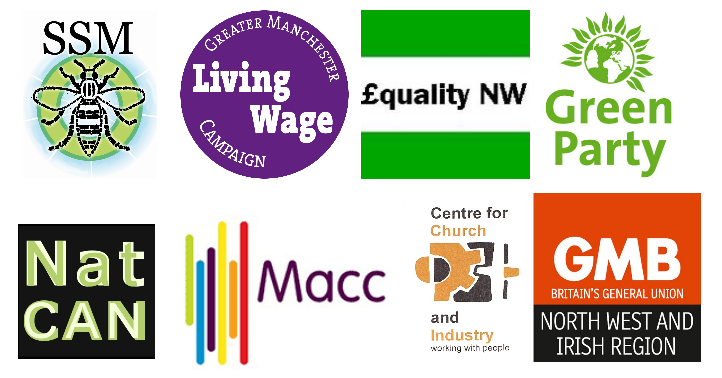 * In Place of Pay Inequality: How local authority pay policies can help make Greater Manchester more equal and sustainable, and why it matters, a joint report by Steady State Manchester and Equality North West, March 2014. This entry was posted in Campaigns, Tameside Green Party and tagged (Benjamin Irvine), (Joe Taylor), (Kevin Flanagan, (Mike Wild), (Philip Duval), (Tom Skinner), A letter to Tameside Council on pay inequality, council contracts, Council Leader, Councillor Kieran Quinn Tameside MB Council Leader, Equality North West, GMB North West and Irish Region, Greater Manchester, Greater Manchester councils’, inequality, Manchester, Manchester Alliance for Community Care, National Community Activists Network, St Antony's Centre for Church and Industry, Steady State Manchester, Tameside Council, Tameside Green Party. (Nigel Rolland), the issue of pay inequality by tamesidegreens. Bookmark the permalink.